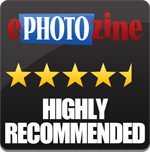 Read our full review of the Pentax 645Z - the most affordable 51.4 megapixel medium format camera released to date. 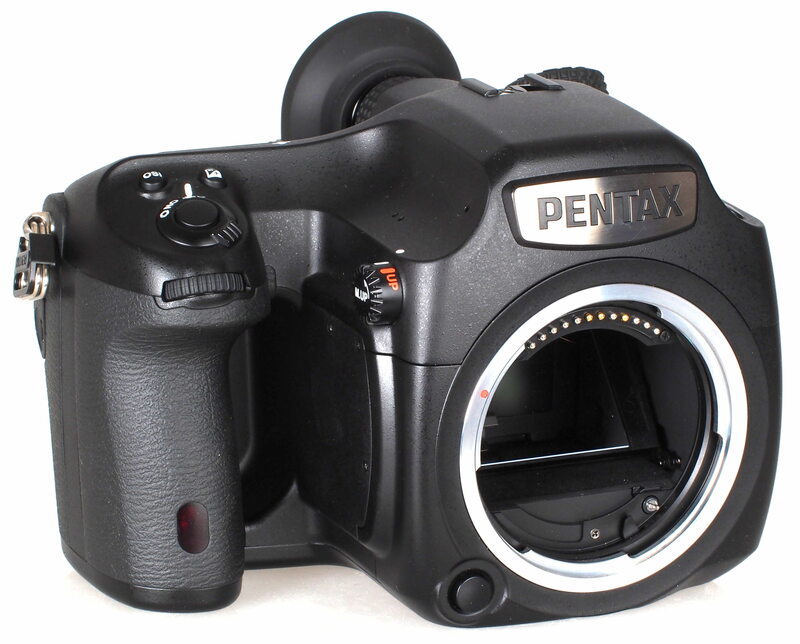 The Pentax 645Z is not only the most affordable 51.4 megapixel medium format digital camera available, it's also the world's first medium format camera to offer full HD video recording, and uses a new 51.4 megapixel CMOS sensor from Sony. The CMOS sensor is 1.7x larger than a full-frame sensor, and the 645z is an update to the 645D, a 40 megapixel camera. 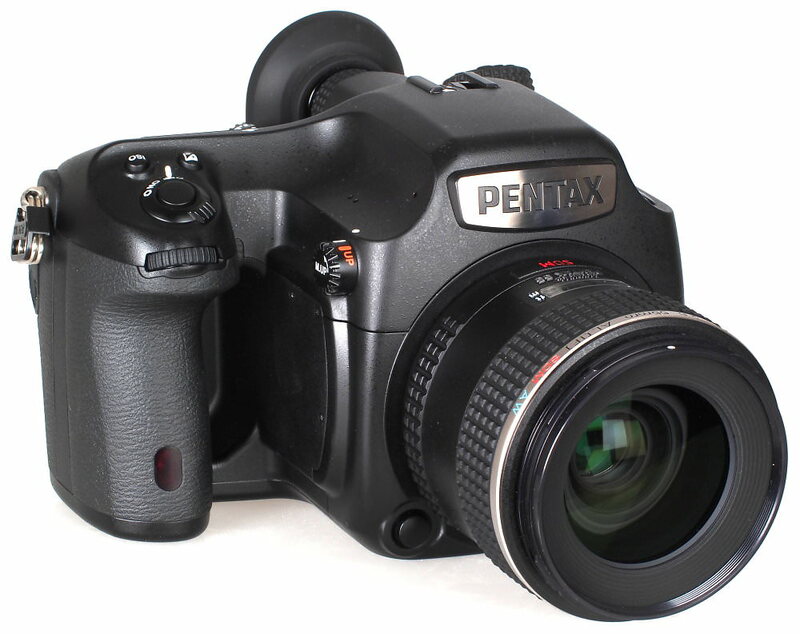 The weather-sealed Pentax 645Z offers a large 51.4 megapixel medium format CMOS sensor (from Sony), measuring 43.8 x 32.8mm, and shoots high resolution JPEG and RAW (AdobeDNG, PEF), images at a resolution of 8256 x 6192. A 35mm full-frame sensor measure 36 x 24mm in comparison. The camera features image sensor cleaning using ultrasonic vibrations -“DR II” with a Dust Alert function - to help keep dust off the sensor as well as warn you when there is any dust on the sensor. The new camera also offers one of the largest ISO ranges available in a medium format camera, from ISO100 to ISO204800, with most other medium format cameras offering a maximum of ISO6400. 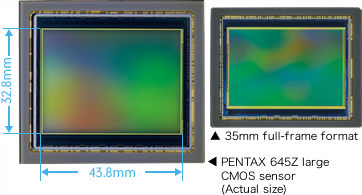 Another benefit of the Pentax 645Z is that it offers 350 continuous shooting, which may not seem very quick when compared to your average Digital SLR, however most other medium format digital cameras with this resolution sensor offer 1.2fps or 1.5fps continuous shooting. Focus is taken care of by a TTL phase-matching autofocus system with 27 AF points, 25 of these are cross-type focus points in the center. 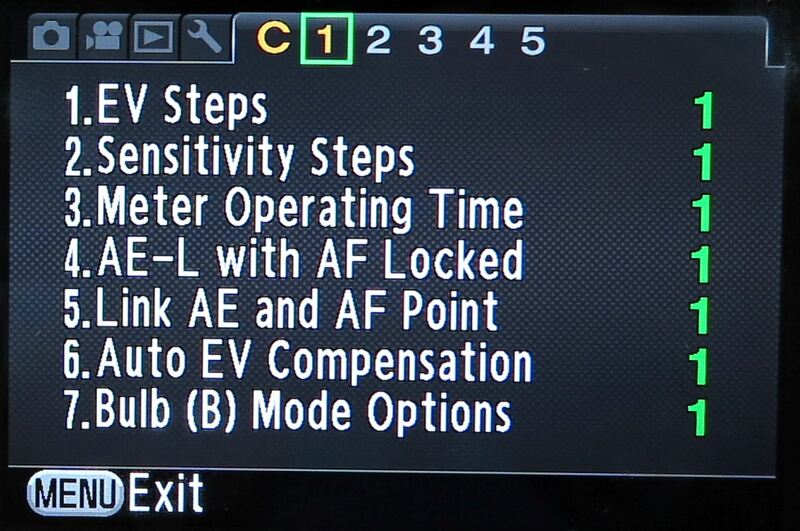 The camera will focus down to 03EV, and continuous AF is available as well as zone and expanded area AF (S,M,L). The camera features the PRIME III image processor, which has lens correction built in including: Distortion Correction, Lat-Chromatic-Ab Adj, Peripheral Illumin. Corr., Diffraction Correction, and Colour Fringe Correction. The Pentax 645Z system is roughly 3 times cheaper than the nearest competitor, such as the Hasselblad H5D-50c available for around £20,000 body only, with the Pentax 645Z priced at £6799 body only. 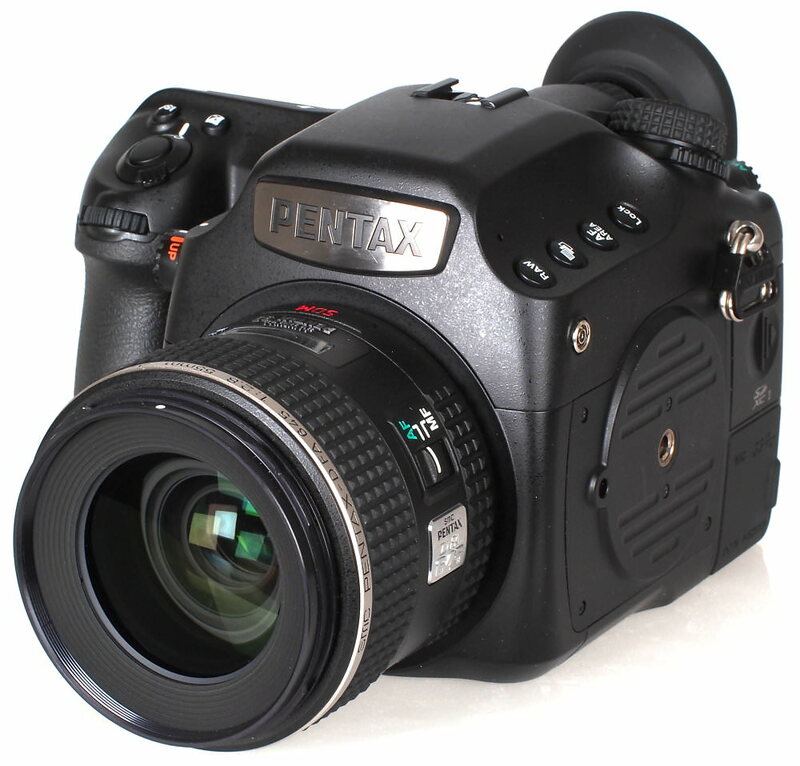 The Pentax 645D with a 40 megapixel CCD sensor will remain on the market and is available for £5099 with lens, making it roughly half the price of other 40 megapixel medium format systems. The Pentax 645Z has a deep handgrip to help give a firm grip of the camera, and when held with both hands feels quite comfortable to hold, however as can be seen in the pictures the camera and lenses are noticeably larger than your standard Digital SLR system. We tested the 645Z with the 55mm f/2.8 lens which gives the equivalent of 43.5mm, and the 120mm Macro lens which gives the equivalent of 95mm. 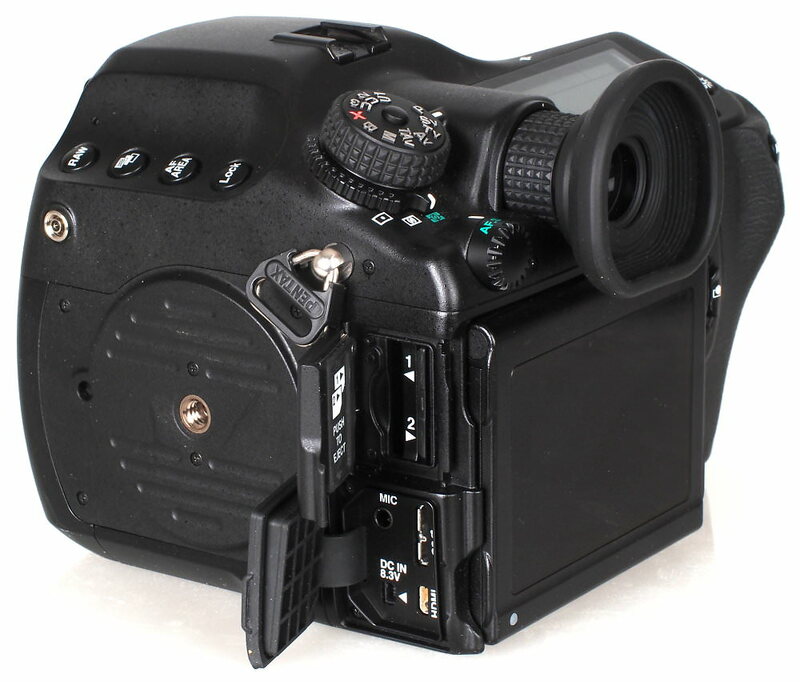 There are numerous buttons and controls, with an additional row of buttons on the left hand side of the camera. 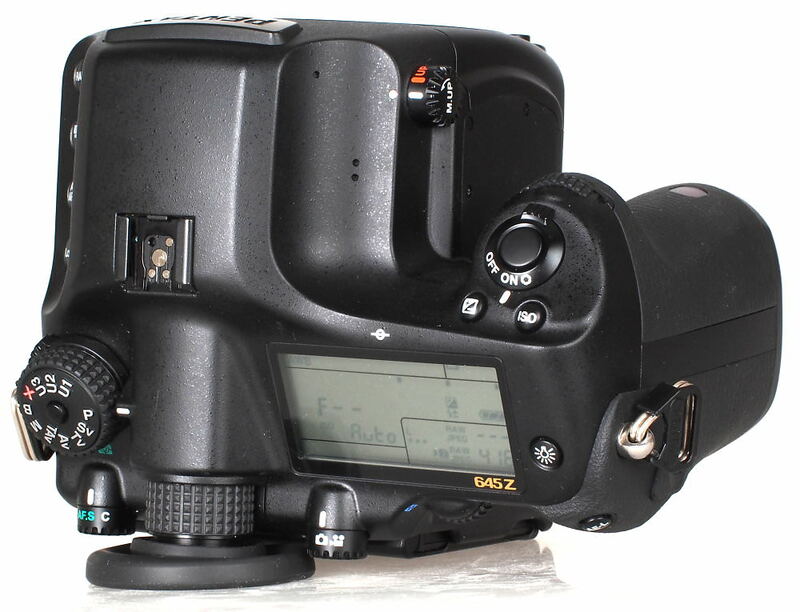 However, the camera is very similar in operation to the Pentax K-3 with the same menu system, a familiar mode dial, and similar buttons and controls on the back of the camera. Using the 645Z feels like using a large Digital SLR camera, rather than a more traditional medium format camera. This makes it relatively easy to pick up and start using straight away without necessarily having to have used the system before. With a weather sealed body (and a number of weather sealed lenses) it means it can be used in the rain, as well as down to -10C for landscape photography for example. The tilting 3.2inch screen with a 1037k dot resolution is particularly well suited for low angles, or for studio work, and a dual-axis electronic level ensures your photos are straight. 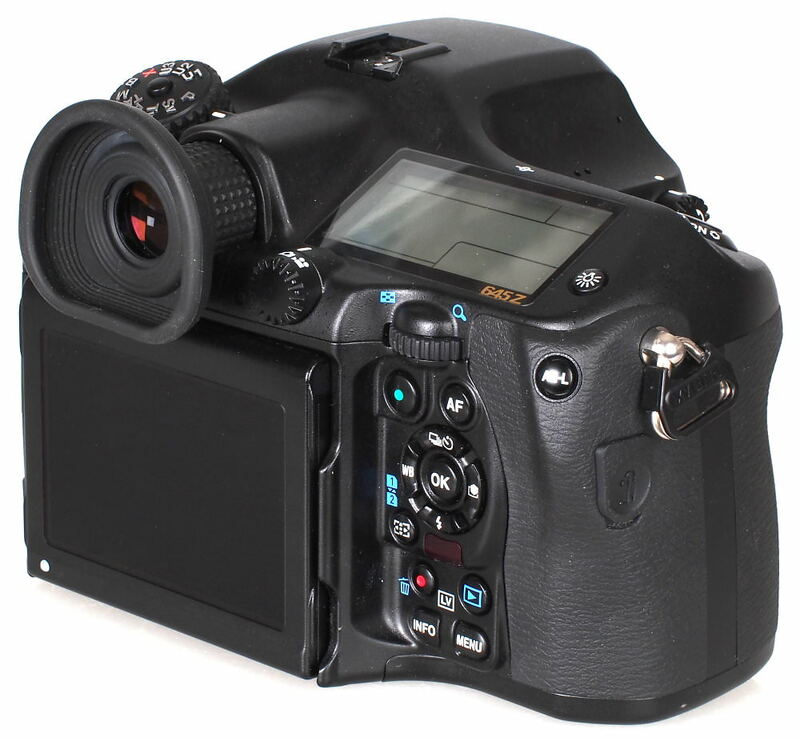 The live-view and tilting screen is of particular use in the studio or where you are not able to use the optical viewfinder. There is a large illuminating LCD screen on top to quickly show shooting information. The 98% optical viewfinder gives a good view of the subject and the natural-bright-matte focusing screen can be changed, if so desired. 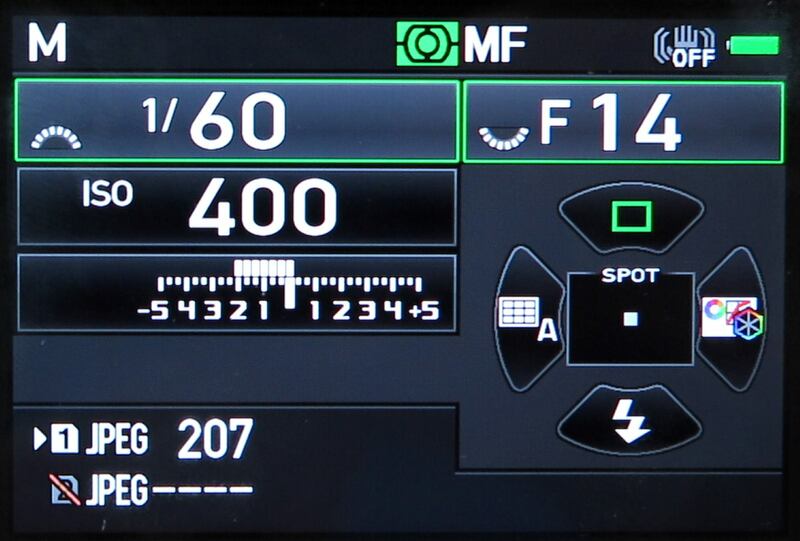 The 645Z has a number of physical controls and dials to make changing settings, and setting up the camera, quick and straightforward without having to delve deep into the menus. 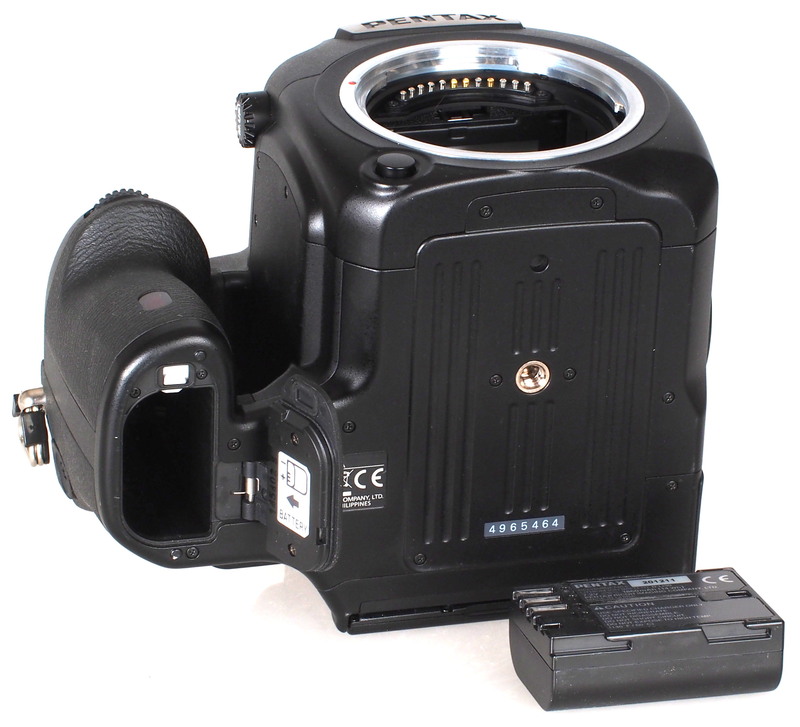 There is a mirror lock-up switch at the front of the camera, with a metering dial under the mode dial, a focus mode dial, as well as a dial to switch between photo and video modes. The top dial features 3 USER modes that can be setup to your own personal tastes. 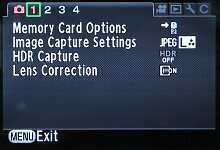 If you do need to go into the menu system, then the menus are quite neatly laid out over several colour coded screens, and anyone who is familiar with other Pentax cameras should find the menus very easy to use. The camera features a USB3 port for quicker image transfer, as well as optional USB tethering software, which is due to be released later. You can also use a Flucard for remote operation from a smartphone or tablet over Wi-Fi. Battery life - Battery life is rated at 700 shots according to Pentax / CIPA test results, which is very good and should see you through a number of days shooting, although for tethered use we would recommend a spare battery of the optional AC adapter. 3fps continuous shooting is the quickest of any medium format camera currently available, and depending on the lens used, focus speeds were quick, although live-view focusing was noticeably slower due to contrast detection focus. Sample Photos - Exposure is generally reliable, although it's worth keeping an eye on the results on the camera, as exposure compensation can be used to avoid over-exposed images. It's possible to get more detailed results by converting the raw images yourself, and this also gives you greater control over sharpness, contrast, colour as well as white balance. The default JPEG output produces images with high levels of colour saturation and contrast, and portrait images show good skin tones, and lots of detail, showing up even the smallest blemish or imperfection. Lens Performance - With a 51.4 megapixel sensor it's possible to capture images with very high levels of detail, and results from the 55mm and 120mm macro lens were very good, although with a large sensor you do need to be aware of the shallow depth of field. The 120mm macro lens is capable of taking detailed close up shots, and another macro lens is available, with built in optical image stabilisation. Dynamic range is good, and the camera has a number of ways to improve the results, including D-range shadow and highlight recovery options, as well as a built in HDR shooting mode. Shooting raw is also a very good way to ensure you capture as much dynamic range as possible, as the JPEG results often show high levels of contrast on default settings. The camera has built in lens correction for distortion, lateral chromatic aberrations, peripheral illumination (vignetting), and diffraction and the camera does a good job correcting for these issues when these options are switched on. ISO Noise Performance - For the lowest noise and best detail possible we would recommend using ISO100 to ISO3200, as images have low levels of noise and good levels of detail. For lower light situations ISO6400 to ISO25600 still provides good results, although noise increases and detail is reduced. At ISO51200 noise levels become strong and we would recommend avoiding this setting if possible, although results may still be useful if resized and used on the web. ISO102400 and above is best avoided as noise is extremely high, and detail is very low. White Balance Performance - Auto White Balance (AWB) gives a yellow and warm colour cast under tungsten lighting, with the tungsten preset giving an accurate result. AWB performs well under fluorescent lights, with the fluorescent preset giving a good result as well. Digital Filters - Custom image modes include: Bright, Natural, Portrait, Landscape, Vibrant, Radiant, Muted, Bleach Bypass, Reversal Film, Monochrome, Cross Processing. These can be adjusted to your own personal tastes. Video - The 645z records fullHD video, and has a microphone socket but not a headphone socket. 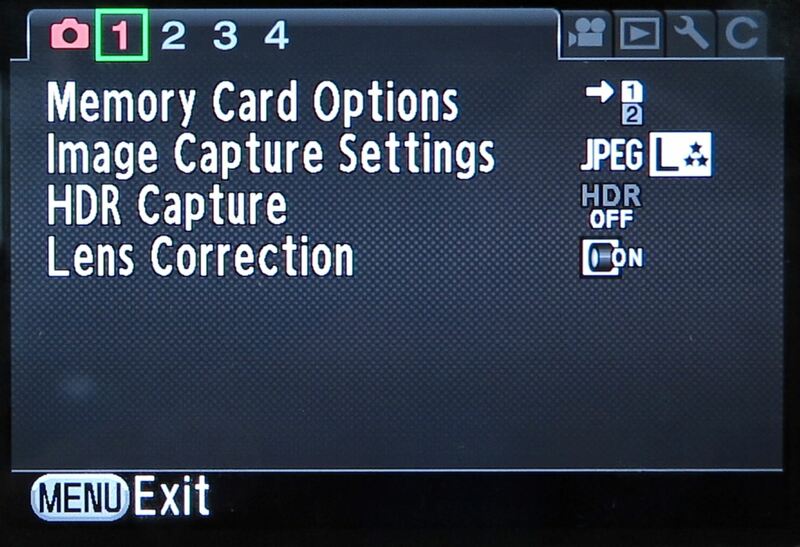 Electronic image stabilisation is available. ISO6400 is the highest ISO setting available when recording video. Alternatively for a high resolution camera, you would need to look at the 36 megapixel full-frame Nikon D810 and Sony Alpha A7R, both with a smaller camera body and lenses, available for £2699 for the Nikon D810 body only, or £2099 for the Sony Alpha A7R body only. The Pentax 645Z offers the best value for money for a 50 megapixel medium format camera available, and is one of the most affordable high resolution cameras available offering such a high resolution. Whilst nearly £7000 for the 645Z body may seem quite a lot in the digital camera market, it is much less than the competition with the nearest competitor, the Hasselblad H5D-50c available from £18,700. For those that need the highest resolution possible, the Pentax 645Z is an excellent option, offering a high resolution 51.4 megapixel sensor, along with Digital SLR styling that makes it relatively easy to pick up and start shooting. For those that want a high resolution but can not justify the price of the camera, then the Nikon D810 and Sony Alpha A7R offer much more competitively priced options, albeit with a lower resolution of "just" 36 megapixels. To get the best out of the camera, we would recommend shooting RAW, as the default colour options on the camera can produce high contrast images, as well as overly saturated images. It's also possible to extract more detail from images, as well as produce images with less noise visible when shooting raw. Noise performance is good and the camera features full HD video recording, along with a lot of user-friendly options to improve the dynamic range recorded by the camera. As the camera offers an impressive range of features, a high resolution sensor, and is very competitively priced, we would highly recommend the Pentax 645Z. The Pentax 645Z offers an ultra high-resolution 51 megapixel sensor in an easy to use medium format DSLR body, and delivers excellent image quality. I'm a big fan of medium format and miss my Hasselblad/Phase One system, which I sold when studio commercial work died off in favour of portrait and landscape work (it was the old H20 so needed to be connected to a Mac at all times, so not really practical for landscape work). I will be updating my cameras later this year/early next, and this Pentax has me seriously interested. The price, handling and features seem perfect for landscape, and will probably work a dream for portraits too. I produce very large prints and the detail in these shots are just what I'm after. The only thing that could stop me moving to Pentax is if Canon decide to do something in the higher pixel end like Nikon and Sony have, so I don't have to sell all my kit! I'm a big fan of medium format and miss my Hasselblad/Phase One system, which I sold when studio commercial work died off in favour of portrait and landscape work (it was the old H20 so needed to be connected to a Mac at all times, so not really practical for landscape work). I will be updating my cameras later this year/early next, and this Pentax has me seriously interested. The price, handling and features seem perfect for landscape, and will probably work a dream for portraits too. I produce very large prints and the detail in these shots are just what I'm after. The only thing that could stop me moving to Pentax is if Canon decide to do something in the higher pixel end like Nikon and Sony have, so I don't have to sell all my kit! Some raw sample would be better, as it gives us something to try and see for ourselves.